I’m so glad you all understood where I was going with the last post. You don’t need a huge wallet to enjoy proper food on your holidays. Instead, save your hard earned cash for clothes and make up products! I got a bit sloppy photographing everything on day three and four, though. I forgot to take pictures at Wahaca, an amazing Mexican restaurant with two branches in London. I also went to Yo! Sushi twice, but figured just one picture frenzy would be enough. And I forgot to take pictures of our Pret A Manger breakfast. Luckily I ate porridge again, so no worries about that one. Also, I discovered Tossed at this lunch arena behind Paddington Station (loads of offices there), which was very tasty as well, but kind of expensive. I really, really, REALLY love Yo! Sushi. I even loved it before I discovered I actually like to eat raw fish. If you don’t, or if you’re vegetarian, you can still find a whole lot at this place. 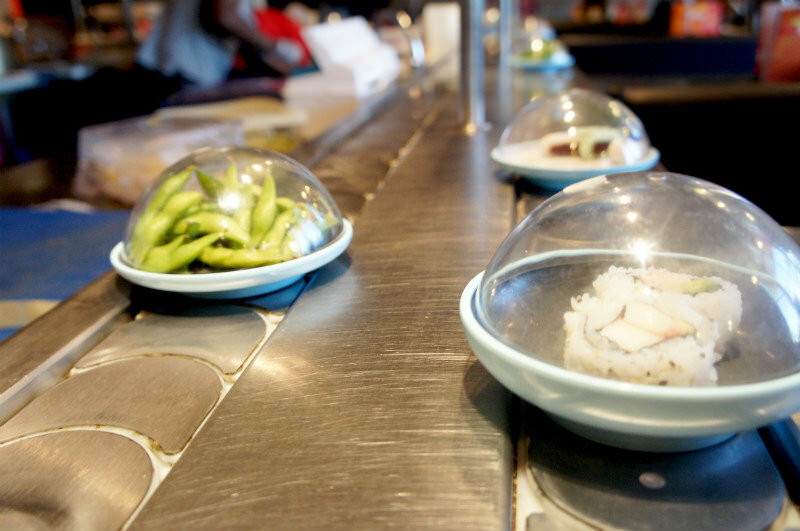 The fun part is the belt on which you’ve got all these little pots with sushi tapas in. You just pick up whatever you want, or if you don’t see what you’d like you can ask for it and the chefs will prepare it right in front of you. You know the price through the color of the dish; blue being the cheapest. On Monday though, most dishes get a blue label. That’s why we went on Monday, obviously! Breakfast Club is HEAVEN. There’s a branch in the East and one in Soho, and I love the Soho one the best. It’s very vibrant and loud, and you’re not allowed to sip coffee all day and steal their wifi, so you’ll surely be able to get a spot if you make it there on time. I always take the pancakes with berries, which costs less than six pounds. The coffee is amazing as well and the fresh orange juice comes with ice cubes. Love, love, love it. Don’t leave London without trying it out! Be very early or prepare to wait half an hour on Saturdays, go before 10.30 on Sundays. Itsu is pure take away goodness. It looks like Pret A Manger or FRESH with the same counter idea, but it clearly is not the same. At Itsu you can mostly buy Sushi or veggies with rice and noodles. The price is quite alright as well, I believe the tray of salmon sushi was just under 5 pounds. They pride themselves on their healthy foods and don’t believe in fatty take away. And it tasted really good as well! And then I forgot to photograph the rest of the trip.. So sorry! But be sure to check out Wahaca and if you spot a Tossed somewhere, you should definitely whip together your own salad!